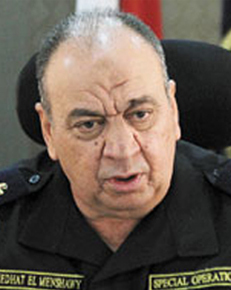 Major General Medhat al-Menshawy is a career officer who served in a number of prominent posts within the Ministry of Interior and made a name for himself by violently confronting and dispersing Islamist protesters and militants. He served with the Central Security Forces (CSF) in downtown Cairo during the 2011 demonstrations against then-President Hosni Mubarak, earning inclusion on a list of senior Interior Ministry officials whom activists demanded that prosecutors investigate for deaths of protesters. By June 2012, he had been promoted to head of the Special Operations Directorate within CSF. In May 2013, Menshawy temporarily deployed to al-Arish, North Sinai, with a detachment of CSF troops sent to respond to the kidnapping of seven soldiers by militants in the region. The hostages were released days later after peaceful negotiation with the group Tawhid wal-Jihad. Menshawy received more media attention starting in the summer of 2013, with his involvement in the Rabaa dispersal and subsequent events. After the removal of President Muhammad Morsi in July 2013, Morsi’s supporters established protest camps in Giza’s Nahda Square and in front of Rabaa al-Adawiya Mosque in Nasr City, a Cairo suburb. On August 13, 2013, Menshawy, who was then head of the Special Operations Directorate, which is also known as the Egyptian Special Forces (ESF)((The name of Menshawy’s unit at the time of the Rabaa dispersal has also been translated into English as “Egyptian Special Forces” or ESF. )), led a paramilitary operation involving troops from Central Security Forces (CSF) and Special Operations to disperse the camps. The Egyptian government acknowledges that at least 600 protesters died in the operation, and Human Rights Watch reported that at least 817 were killed, with the actual number likely over 1,000. After the Rabaa and Nahda dispersals, Islamists reacted to news of the protest camps’ clearing by burning churches and attacking police stations. The major suburb of Kerdasa, Giza, had effectively been taken over by Islamists after a mob killed 15 policemen in a local police station in mid-August. Similarly, the village of Delga in Minya had been outside government control since Morsi’s removal from power. The Egyptian state set out to reassert its authority, with Menshawy leading Interior Ministry and army forces in the forcible retaking of Kerdasa on September 19, 2013. The operation led to the arrest of 181 suspected militants, but also resulted in the death of one police general and injuries to 10 other police officers. Menshawy described the events at Kerdasa as a “purge of terrorist and criminal lairs,” and was promoted to Assistant Minister of Interior for Special Operations in November 2013. As assistant minister, Menshawy was involved in the security operations for major national events, including the January 25 commemorations, the constitutional referendum, and presidential elections. On January 22, 2014 – just three days before the third anniversary of the January 25 revolution – Menshawy threatened to use violence, including live ammunition, against protesters who disrupted official celebrations. By January 27, 2014, at least 64 had died in the anniversary demonstrations, with well over 200 injured. Though he generally kept a low profile, in August 2014 Human Rights Watch (HRW) said that Menshawy should be investigated for crimes against humanity for his actions during the Rabaa dispersal a year earlier, along with then-Defense Minister Abdel Fattah al-Sisi and Interior Minister Mohammed Ibrahim. Menshawy denounced the HRW report, saying that it overlooked key facts about the nature of the protest, and defended the operational plan and its execution by government forces. In other statements to the press, Menshawy has claimed that security forces have made great headway in their operations against terrorists in the Sinai, allegedly entering villages that have been without a government presence for 17 years. Like many of his colleagues in the security establishment, Menshawy’s public comments on Morsi’s year in office are disparaging. Menshawy said in an interview that Morsi attempted to arrest 70 leaders of the security establishment, but that Interior Minister Ibrahim refused to carry out the order. Menshawy holds Morsi’s Muslim Brotherhood responsible for the violence at Rabaa, claiming that protesters shot first and the Brotherhood sabotaged negotiations and observations from international groups. Menshawy has also stated his belief that the Muslim Brotherhood is attempting to assassinate him, claiming that he has received threats and that militants have targeted several other senior officials. Pro-Brotherhood media have returned the contempt, calling Menshawy the “leader of the Rabaa butchery” and accusing him of setting the Rabaa mosque on fire while it was filled with the bodies of dead protesters. On December 25, 2014, Menshawy was promoted to Assistant Minister of Interior for Central Security, replacing Shoaib Siaam.